​The main function of Spherical Plain Bearing GEZ.FO Series is to support the mechanical rotating body, reducing the friction coefficient during its movement and ensuring its rotation accuracy. It can be understood that it is used to fix the shaft so that it can only achieve rotation and control its axial and radial movement. If the shaft does not have a bearing, it will not work at all. The main function of Spherical Plain Bearing GEZ.FO Series is to support the mechanical rotating body, reducing the friction coefficient during its movement and ensuring its rotation accuracy. It can be understood that it is used to fix the shaft so that it can only achieve rotation and control its axial and radial movement. 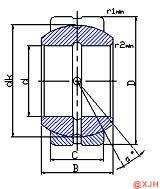 If the shaft does not have a bearing, it will not work at all. Because the shaft can move in any direction, and the shaft is only required to rotate when working. 6) Properties: Heavy duty, good wearability, corrosion resistance, self-alignment. Spherical Plain Bearing The life of the GEZ.FO Series is related to its corresponding size and load conditions. If it is used under normal conditions, the rolling surface of the ferrule and the rolling element may be repeatedly subjected to alternating stress, and the material may be fatigued, causing peeling and being unusable. The total number of revolutions at this time is also the fatigue life of the joint bearing.